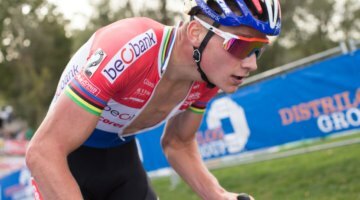 WATERLOO, WI—After an uncharacteristic crash-marred outing at the Trek CX Cup on Friday, Sanne Cant (Beobank-Corendon) was looking to bounce back at Sunday’s World Cup Waterloo. The defending world champion’s trips to the U.S. have yet put on the technical show Cant has displayed in Europe, but the large crowd gathered in Waterloo was anticipating the rainbow stripes to feature at the front. With the course at Trek headquarters turned bone dry and dusty by high temperatures and a weekend of racing, it was certainly the type of technical course tailor-made for Cant’s skillset. The question was if she could put Friday’s crash behind her and turn her training into race success. Cant certainly had plenty of competition to battle for the first-ever World Cup Waterloo title. 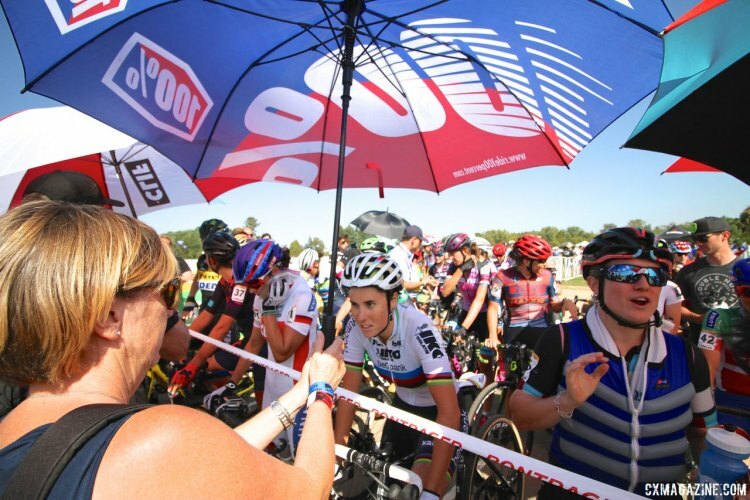 Arguably at the top of the list was Wisconsin native Kaitie Keough (Cannondale p/b CyclocrossWorld), who was looking to write a storybook ending to her 2017 trip to the Midwest. 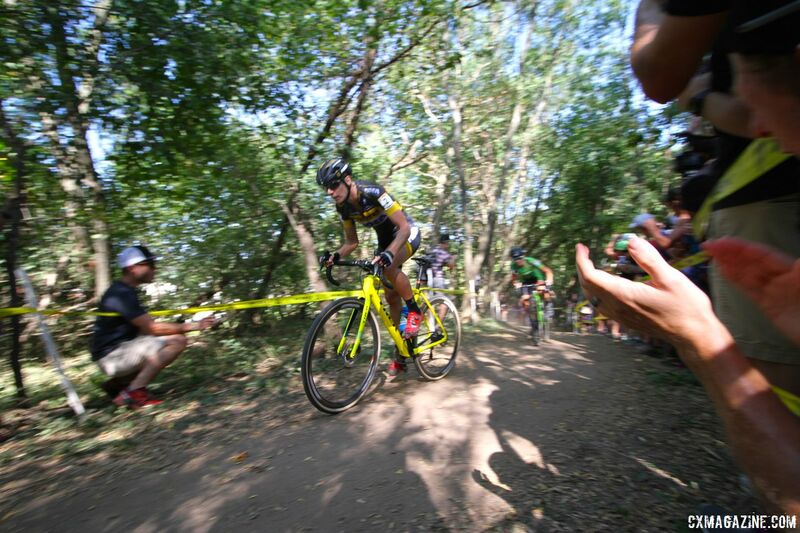 Keough had a large contingent of family and friends supporting her in the crowd and when she raced to the head of the field early in the race, it was clear she was ready to compete for the win in Waterloo. Keough got off to a fast start while Cant got caught up in the field after she did not get clipped in at the start, but 45-minute cyclocross races offer plenty of racing for the patient and those with their eyes on World Cup points over camera time. Keough, whose nickname is the Little Badger, put on an early show for the home crowd by grabbing the holeshot and leading the train well into the first lap. Keough and her family got a special moment when she went roaring past her personal cheering section that included her grandparents, parents and brother and sister. It turns out, the fast start was not necessarily in her plans. Perhaps upset that Keough stole her normal role, Ellen Van Loy (Telenet Fidea Lions) roared to the front at the section through the trees nicknamed Little Zolder and then just kept going. Van Loy is known for her fast starts, but thus far this season, she has been carrying her fast starts later into the race. With eight seconds on the chase group of Keough, Ellen Noble (Aspire Racing) and Sophie de Boer (Parkhotel Valkenburg – Destil Cycling Team), Van Loy looked like a threat to exploit her early gap on the hot afternoon. At the end of lap two, the two groups merged and a who’s who group of Compton, Keough, Noble, Nash, Cant and De Boer united for a tour as the chasers. However, Van Loy’s lead was still at 12 seconds. They say third time’s the charm, but for Ellen Van Loy, the old adage did not prove true on Sunday. By the time Sunday’s World Cup race went off, the course in Waterloo had been turned into a dusty Midwest field. Several of the corners were rendered deceptively challenging by a layer of dust that accumulated on the hard-packed ground. Van Loy learned about one of these corners the hard way. Van Loy slipped out making a turn early in the third lap and went down to the ground. Her large lead was instantly erased, and the chase was now seven riders. Nash was sitting toward the back of the chase when her hopes of continuing her World Cup win streak was paused by a bad pass through the pits. She fumbled the exchange with her pit crew and wasted several seconds securing her pit bike before heading back out onto the course. The next victim of the third lap was Compton. She nearly slipped out on the tricky adverse camber downhill, but recovered at the last second to maintain her second position. However, when the lead group emerged from the woods later on, Compton was nowhere to be seen. 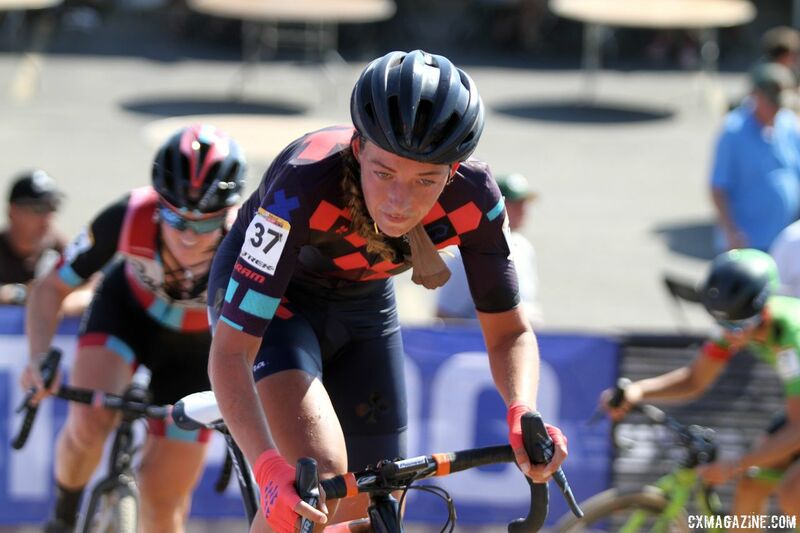 Cyclocross Magazine spoke with Compton’s partner Mark Legg after the race, and he said Compton had an allergic reaction to a bee sting from Saturday and was having trouble breathing. She would still finish the race, only eight minutes behind the winner. One of Sanne Cant’s secrets to success is her patience as the chaotic opening laps play out. Cant attached to the lead group at the end of lap two and then worked her way into the driver’s position of the lead selection. The steep incline at the exit of Trek Factory Hill was also rendered more difficult by the gathering dust. Choosing the right line heading into the feature was of utter importance, and during the first two laps, the lead riders made their line choices with varying levels of success. There was also a premium placed on being the first rider to hit the feature, and Cant knew that as the riders approached the imposing steep incline for the third time. Cant rode the Trek Factory Hill incline perfectly, while her closest chaser De Boer dismounted and was forced to run after not getting her line right. Cant immediately sensed an opening and attacked. She had an eight-second lead in just a few hundred meters. 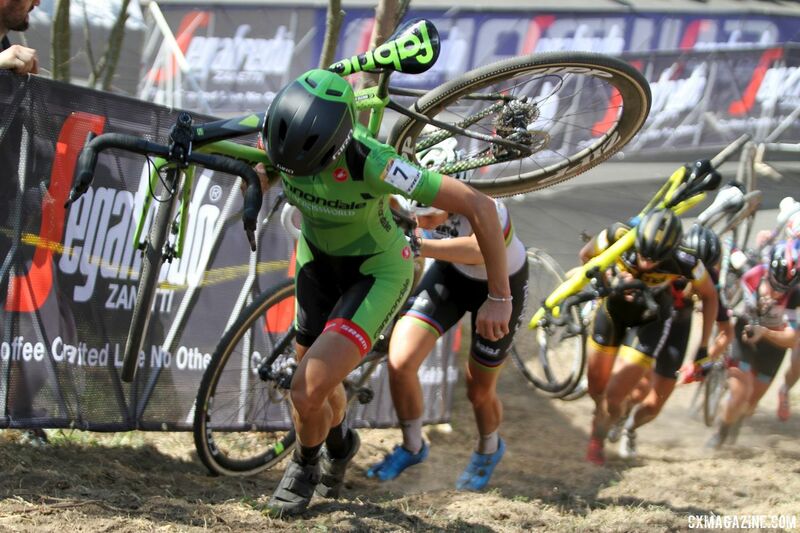 Sanne Cant had a gap, and she was not going to leave anything to chance after Friday’s race. She accelerated out into the penultimate lap and when the literal dust settled as the bell rang, her lead was a massive 18 seconds. She stayed perfect for one more lap, rode the Trek Factory Hill one last time and brought home a victory to complement her third-place finish at Jingle Cross. 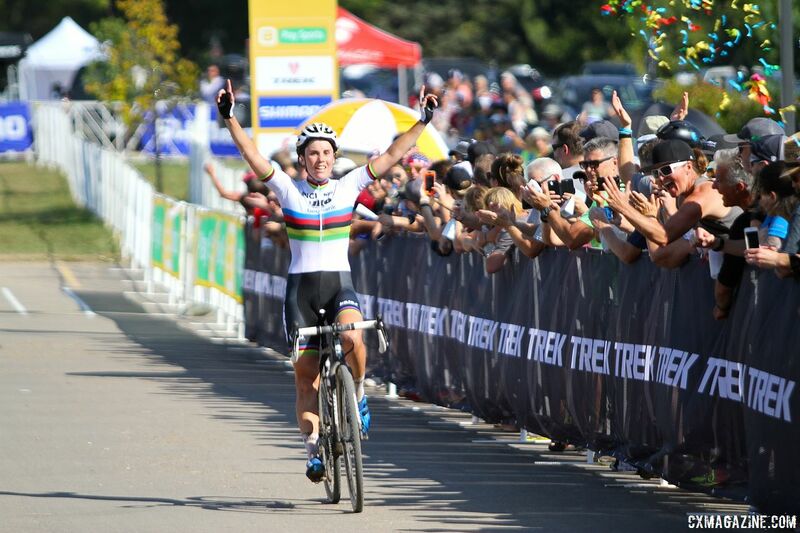 She now heads home as the World Cup leader, ready for the more Belgian-like conditions where she excels. Once Cant was gone, the chase group was quickly resigned to battling for second. De Boer recovered after her dismount at the hill and led Keough, Noble, and the others into the penultimate lap. As the fourth lap unfolded, that trio of riders was looking the strongest while Mani, Nash and Van Loy appeared to be doing their best just to stay part of the group. Nothing changed during the course of lap four, and at the bell, the last two podium spots were there for the taking. One of the key features of the Waterloo course that was not part of Friday’s C2 layout was the steep Segafredo Run-Up (née the Loathing Dock) located a little over halfway into the circuit. It would no doubt be a feather in the cap of the course designers if a feature they unveiled just for Sunday’s World Cup proved to be decisive in a race outcome. Feather in the cap achieved; the run-up was decisive. Immediately after her feet hit the ground, Keough exploded up the hill and got a gap when she remounted her bike. De Boer also had a good run, but the advantage for second now belonged to Keough. She surged to stretch the gap. Behind her, De Boer and Noble did their best to reconnect with Keough, but the Wisconsin native clearly had something special left to give in front of the pro-Kaitie contingent in Waterloo. Keough aced the last climb up Trek Factory Hill, and her second-place finish was secured. With two second-place finishes in the two Midwest World Cups, Keough not only put on a show for her family and friends, but she also set herself up nicely in the overall World Cup standings heading back to Europe. Earlier this summer at a camp she put on for Junior Women, Ellen Noble had each camper share her “scared to say it out loud” goal. Noble’s hush-hush goal was to get a World Cup podium finish. Last weekend at Jingle Cross, Noble made a big step toward her goal by riding a strong start to an eighth-place finish. On Sunday in Waterloo, Noble started fast, and as the laps ticked away, she was still there in the chase group. Noble said her experience last weekend and preparation had her ready for her strong ride. 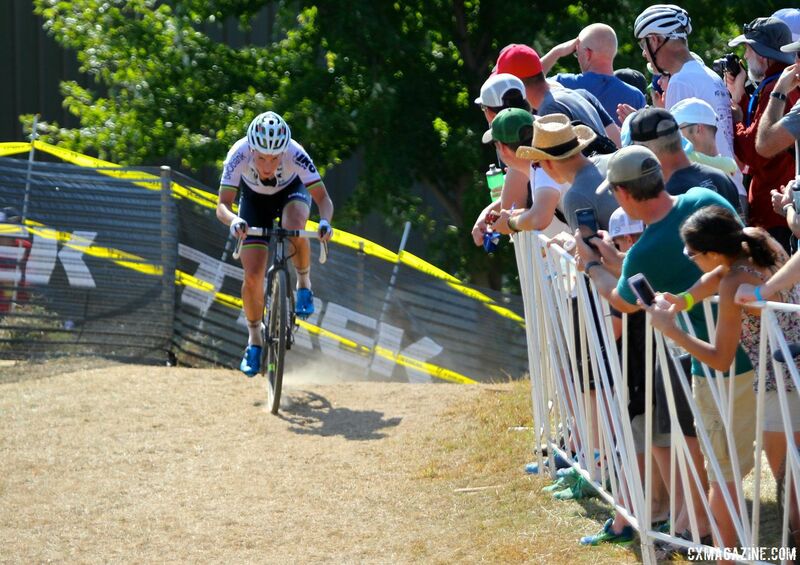 As Noble neared her last trip through the Trek Factory Hill maze, only De Boer stood between Noble and her goal. 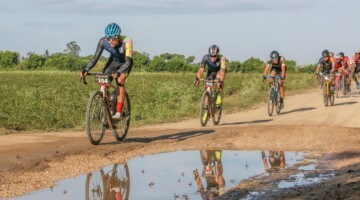 Both Noble and De Boer rode the Trek Factory Hill incline cleanly, and only a downhill off-camber and a stretch of pavement waited before a 180-degree turn onto the finishing stretch of tarmac. Noble let De Boer take the lead through the off-camber and heading toward the last 180-degree turn. On the last turn, De Boer went wide while Noble used her technical skills to take an inside line and grab the advantage into the sprint. Noble maintained her advantage and sprinted across the line for her first UCI World Cup Elite podium. 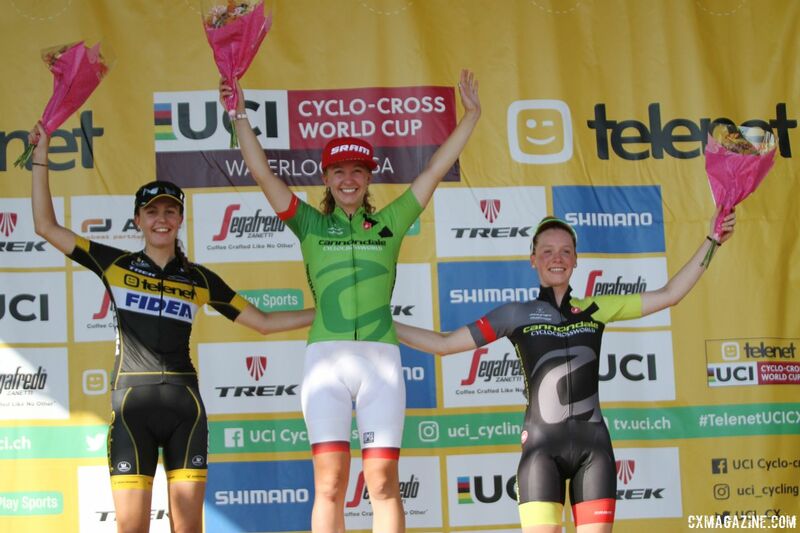 Emma White (Cannondale p/b Cyclocrossworld.com) came into Sunday’s race wearing the World Cup U23 leader’s jersey. Early in the race, the biggest challenge to her defense of the early-season jersey was the myriad of crashes in the dusty corners. White survived and put herself in a top-eight position near the front of the race. After Cant went and the group tried to sort itself out during the fourth lap, White was able to pull into the dreaded close-but-not-there spot just behind Van Loy and Nash. 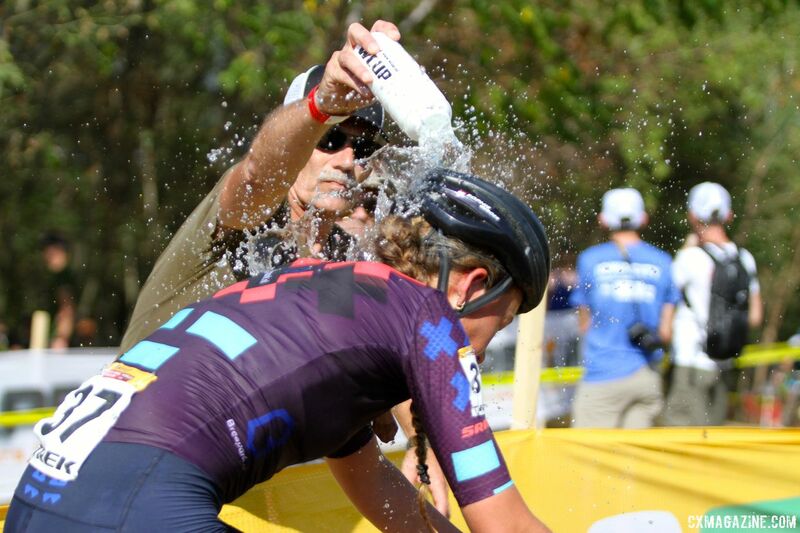 She was never able to make the catch, but she still took home a solid eighth-place finish overall and retained the U23 leader’s jersey after the weekend. White is currently a student enrolled at Union College in New York and does not plan to travel to the World Cups before Namur, but for now she gets to enjoy her position atop the World Cup U23 rankings. After a two-week trip to the U.S., the Europeans will return home for the start of the Hansgrohe Superprestige series in Gieten on Sunday. The Americans head to Thompson, Connecticut for the KMC Cross Fest. Stay tuned to Cyclocross Magazine for coverage of both. Check back regularly for the latest in our ever-growing coverage of the important week in racing. What’s with the American podium women not taking their hats off during the winner’s national anthem? Katie K. did it in Iowa too.